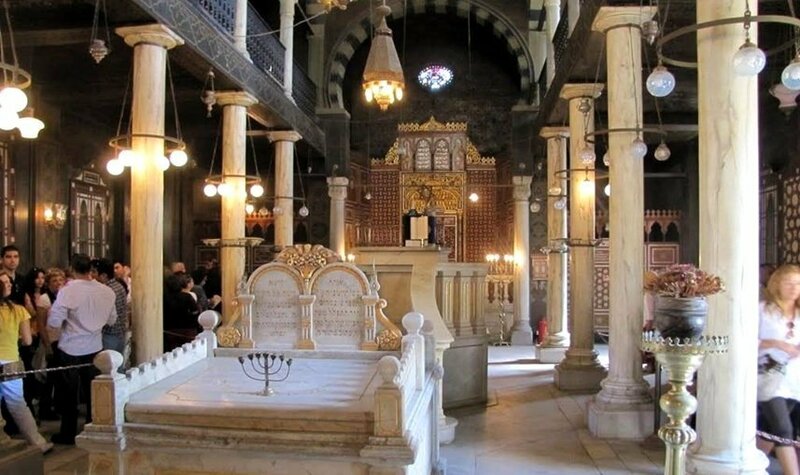 The Synagogue of Ben Ezra was originally named El-Shamieen Church, and is situated behind the “hanging church”. The Synagogue once had an old copy of the Old Testament, and it was said that Ezra the Prophet (Al-Azir) had written it. In the Encyclopedia Britannica, a Synagogue is described as “A prayer place for the Jews”. In old Greek it means: “The usual place where the Jews assemble to receive religious teachings and to worship” Some of these Temples were built close to a source of water, as much as for protection from any attack, not just for ablution! It is believed that the site of the Synagogue where the box of Baby Moses was found. The Ben Ezra Synagogue was originally a Christian church that the Copts had to sell, to the Jews, in 882A.D in order to pay the annual taxes imposed by the Muslim rulers of the time, and therefore Abraham Ben Ezra, who came from Jerusalem during the reign of Ahmed Ibn Tulun, bought the church for the sum of 20,000 dinars. Through the centuries, the Synagogue received extensive restorations and renovations until it reached its present state. The present building dates back to 1892; the original one had collapsed and a new one was built, echoing it. It is rectangular in shape, measuring 17m in length and 11.3m wide. It is divided into 3 parts, the largest being the middle one (4.75 m in width); these parts are divided by steel bars painted in a marble-like color. There is a platform located in front of the sanctuary, where the rabbi stands to read the Torah. The lector platform is in an octagonal shape and is made of marble. A copper fence is situated on the 8th side of the platform, where the Torah, and its rolls, is rested. There is a memorial Stella located in front of the platform. In the middle of this Stella is a top part consisting of 2 semi-arches carried on 3 pillars, with a height of 85cm. there are 2 rooms on each side of the Holy Ark on the 1st floor. This decoration goes back to the Turkish Period. It is clearly seen on the side halls with patterns such as, star patterns, pentagonal patterns and rectangles. Used as a background for the geometrical patterns, they are also found around the Star of David in the middle of the ceiling. Here is a mixture of the Hatai and the Roman decorations, which are floral patterns and are called “Ottoman Arabesque”. This decoration includes floral patterns, palmettos and lotus flower. The south eastern side of the top of the Torah closet is decorated with stalactites, on top of which is a semi circle with ray decorations. The frame of the Torah Ark is a mimic decoration and on each of the two sides are 2 wooden columns with geometrical patterns. The 2 columns have stalactite capitals of the Ottoman period.